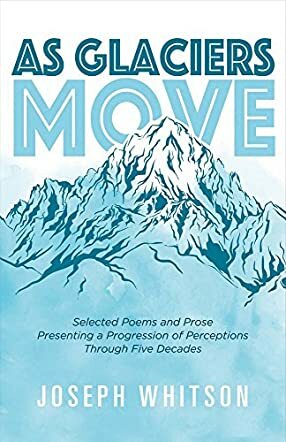 As Glaciers Move could be the author’s memoir, although unorthodox and metaphorical: the poems and prose are in chronological order from 1975 (when the author was a teenager) to 2017 (as he entered the second year of living with terminal cancer), and the book’s premise is the “progression of perceptions.” Joseph Whitson has been a carpenter, machinist, stay-at-home dad, computer technician, college instructor, research scientist and business owner. He has been writing poetry for 42 years, capturing the emotions of his experiences and observations in his poetry, a diverse and inspirational collection. A few of Joseph’s earliest poems, for example, reflect the ravages of war from his perspective, his parent’s home in West Germany in 1975, as he heard about the Cambodian genocide. Joseph has an A.A. in English, B.S. in Biological Sciences and an M.S. in Cell and Molecular Biology, and all the degrees exist in his poetry as reflections of the experiences, people and locations these pursuits and career paths provided. Joseph’s hobbies (alpine climbing, backpacking, and whitewater kayaking) are also prevalent throughout his poetry. He is now writing full-time, and his hobbies are less dangerous, such as gardening and amateur astronomy. However, even in his most recent poems and prose, there is a sense of adventure. Joseph lives with his wife of 38 years and their two cats in California. He is a loving husband, father, and grandfather. As Glaciers Move by Joseph Whitson is a lovely book of poetry. Whitson has attempted to outline his whole life with poetry. Various episodes appear, including everything from birth to death; first love to marriage. It would seem that one is reading Whitson's most intimate details of his life, but in reality,one is reading his emotional responses to the various events. So rather than revealing specifics, he is revealing very intimate feelings. And feelings are, after all, subjective. Glaciers, as everyone knows, move so slowly you cannot see the movement to stop and stare at one of them. Just like life, time passes without our realization. I frequently hear people say, "I can't believe it's September already." Or, "I can't believe it's been 50 years since I was in high school." By stopping and observing the moments, you can possibly learn and gain more from your life. Those who know me were astounded to find that I read, liked, and reviewed a book of poetry. I frequently find poetry to be trite, but As Glaciers Move by Joseph Whitson is a vast exception to that rule. I could tell when I read the summary that it was different and worth taking a closer look. Perhaps I move slowly too. I have had many experiences in my life, in my 58 years, and could do with more reflections on those experiences to learn from them. I often keep too busy and do not take much time for reflecting. Maybe poetry allows us to do that. Maybe I should read more poetry. But I believe that anyone who likes introspective poetry will gain a lot from reading this book. It's certainly changed my perspective. As Glaciers Move by Joseph Whitson is a volume of poetry and prose written by the author over a period from 1975 to 2017. It contains a broad range of subject matter and, as one would expect, a variation in style, approach and standpoint over such a long period of time. Whitson links the slow but powerful action of glaciers as they shape mountains with the insidious effects that influential persons, health, career or religion have on our outlook and beliefs over our lifetimes. The poetry is well-structured and accessible in the main, though one or two may be difficult to fathom - I am thinking of a one-stanza piece called Nursery Rhyme in particular. This author seems to be at his best when writing about nature and the great outdoors - one finds a good deal of his metaphors and similes are linked to nature. For example, there is a beautiful image in the poem Psalm of a Tree, which fair takes your breath away: ‘And the tree, reaching to heaven even as it embraces the earth.’ Aquarium, a short piece of prose, is a moving meditation on the poet’s feelings of isolation and disconnection from the world, while The Crazy Woman Next Door will make you laugh. The collection contains something for all tastes. It took me a while to immerse myself in this poet’s work; initially, As Glaciers Move seemed to be a jumble of disparate works in a confusing array of styles, but as I moved through these reflections on Joseph Whitson’s life and world, the words slowly started to sing. I am not going to be tempted to use the gradual action of a glacier as a metaphor, but if I can give any advice, I would urge you to approach this collection from the opposite end. Start with the last poem, The Stranger and I, a brilliant piece, and work backwards, paying particular attention to Acceptance, then Anger, and work your way back to the first poem, Khmer Rouge. You will find As Glaciers Move a sometimes challenging but often moving collection that I do not hesitate to recommend. As Glaciers Move by Joseph Whitson is a collection of poetry that focuses on the forces, whether they be of pain, joy, or hope, that shape our being, and that, like glaciers, have a powerful influence on our lives. The collection is separated into three parts. Arête deals with suffering, and the lengths we go to escape it. Horn illustrates how frightening life can be at times, but beautiful all the same. Cirque talks about life's fragility, as well as the eternity of the experiences you carry with you. I love the way Whitson utilizes nature within his collection. With each part, he reveals a piece of himself that contributes to his kaleidoscope of memories. A bittersweet tone persists within his words. Each title coalesces the lessons and conflicts into a unique culmination of experiences that reveal just how paradoxical life can be. What struck me most about this collection was how well Whitson carries these emotions. Two poems that stuck out to me were Anger and Acceptance. My father is a radiation therapist, so he works with cancer every day. He has to witness death on a constant basis, but he also sees just how strong the patients can be. Whether it be through their friends, or family, or even complete strangers, he’s seen patients blossom beneath the concern of others, as if they were anchors to life. Thus, when I read about Whitson, I was touched. I personally enjoyed this collection and would recommend it to those who loved Abandoned Breaths by Alfa.